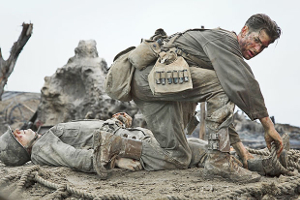 For its first hour or so, Hacksaw Ridge is very disappointing. For another half hour it is active, if not exciting. And then there is a scene that is transcendent; and the remainder of the movie is wonderful. If you haven't seen the movie yet, still do so. But a little advice: As soon as there is text on the screen noting that Doss died at age 87, stop the movie. What follows the note are snippets of genuine documentary — still shots and actual interviews — that, like all documentary postscripts to "true-story" movies, yank you right out of the wonder. And considering that the wonder of Hacksaw Ridge was great and long in coming, it's a shame to let it be killed at last. The transcendent scene comes after the "active" half hour, after we've been watching Doss's company assault Hacksaw Ridge. The combat is decently choreographed. There is a clear plot of advancing on bunkers and being driven back. Yet somehow it wasn't exciting. It was only agitating. Every death is sudden. The deaths accumulate like falling marbles. We're given no time to feel any loss. Even the overnight mid-combat respite in the foxhole was not especially anything. Perhaps I had been numbed by the first hour of the movie, but I kept waiting to be moved by the combat. I will say this, though. The suddenness of every death made everything relentless. Thus, one could get a proper sense of chaos. And futility. So when the company has retreated to the cliff's edge, and every able man but Doss has retreated down the ropes, the tiring brutality has been presented. When Doss looks back on the devastation, we at least know what we're supposed to be feeling. Now, here's an important point about Doss. I'll touch on this again, but even in the disappointing parts of the movie, Doss is a solid and interesting character. It is established well that he is a godly and patriotic medic who refuses to carry a weapon. I believed everything about his courage and conviction. So when he looks back and starts despairing, I believed he was despairing. I despaired only because he did. In the chaos he has not been killing the enemy; he has been scrambling to save his fellows. Some he saved; some he didn't. He is crouched over the corpse of one he didn't. There were so many he didn't. Though he tried so hard! And despairing he says, "What is it you want of me?" He is of course speaking to God. He gazes on the field of failure and complains, "I don't understand." Finally he laments, "I can't hear you." And across the shattered ground, out of the smoke and silence, someone calls, "Medic! Help me!" More voices say the same. There is even a cry of "Help me, Lord!" The moment is so well constructed, that of course we infer that God has effectively spoken to Doss. And Doss hears. He no longer despairs. He rises and purposefully sets out into the devastation. The scene is simply transcendent. Then comes a genuinely thrilling quest, as Doss seeks out the wounded and, one by one, brings them back to the cliff and lowers them by rope. The danger is acute, of course, because Doss is unarmed and will not kill. He must evade the scouting enemy. And even as he becomes exhausted, he repeatedly gasps, "Please, Lord, help me get one more." I did wonder why no one simply joined him up on the ridge to help him. There had been only two sentries at the base of the cliff; but once the wounded men started appearing from above, others came to ferry them back to the base. To be sure, Doss's quest would have been less thrilling if it had not been solo, and I realize that his solo quest is what actually happened; but it did seem odd. Still, it was thrilling. There was a heroism and excitement that I had missed in the earlier chaos of combat. Again, though that combat was good, there was something rote about it — much like the rest of the movie. How I wished I could simply remove the rest of the movie! The last forty minutes — even after Doss's quest has ended and he returns with his company to take the ridge (and, not incidentally, heroically save his captain from a grenade) — deserved better than what preceded it. The particular weakness of the first hour is exemplified by Doss's time in boot camp. It is one cliché after another, right down to the melting-pot-of-America cast of soldiers and the barking from the sergeant about not calling him "sir." The tension with the other soldiers, their bullying and such, reminded me of everything from Pvt. Pyle's troubles in Full Metal Jacket to any nerd's troubles in some 1980s teen comedy. It was flat. Even the scenes of Doss's wooing of his wife, or the scene of his drunkard, abusive father (in Great War dress uniform) soberly interrupting Doss's court martial to save his son, were just checking off Hollywood expectations. I wanted it all gone. And yet, without the information provided by these scenes, that transcendent moment wouldn't have had any foundation. The quest would not have been credible. The key mistake of Hacksaw Ridge is in making Doss's quest the tail of the movie. Every part is developed too much for its own sake, all equally weighted, as we work through one to another until we reach that tail. Instead the quest should be the heart, the beginning and the end, with everything else attached only enough to explain and illuminate that heart. There is a great vignette of Doss as a boy, violently harming his brother and then, in his dismay, gazing upon an illustration of the Ten Commandments and coming upon Thou shall not kill. Yes, this vignette is in the disappointing first hour; but it is an exception to the clichés. It is also a clue to a better construction of the movie. Rather than progress conventionally to the combat (checking boxes as we go), decide what is most relevant about, for example, Doss's wooing and present some vignette succinctly. We need only enough information to achieve that coming transcendence. Hack off the rest. Every vignette could be embedded in the narrative frame of the combat. Or, if that proved cumbersome, the vignettes could still be presented serially, but with each presenting a rather specific facet of Doss's character. Because, in the end, it is Doss's character that matters. One could radically not even name the other characters and still have a complete and powerful movie. Doss is just that interesting. Even as it is, the movie is good. It succeeds at depicting Doss and his heroism. Ultimately, Hacksaw Ridge is that sort of art that completes it most important act so well, its many other shortcomings should be endured.